Yes, This is a Guy's Review of Men's Shaving Products FOR WOMEN! (a must read for ALL Women & the Shaving Industry) - PRETTY IN MY HEAD BLOG | A Funny New Beauty and Lifestyle Blog: A beauty blog with a twist. Fun look at Beauty, Lifestyle, and Fashion with humor. *This post contains affiliate links which means I receive a commission if you click on a link and make a purchase. Please also see my Affiliate Disclaimer here. Yes, your eyes are not deceiving you…Eve’s husband is writing a product review for ‘Pretty in My Head’! Anyone who knows me knows that I am a fashion-impaired color blind guy who once wore a red shirt and purple shorts (yeah, I know…colored cotton shorts were a poor choice for me in high school). I’m not permitted to buy clothes unsupervised, and I don’t wear clothing combinations without prior authorization from Eve…again, red shirt/purple shorts. Living with a woman who omnivorously experiments in beauty regimens has exposed me to products ranging from snail slime to exotic muds…and everything in between. Eve’s tried products that moisturize, exfoliate, and neutralize anything you might imagine…however, I have come to the conclusion that women’s beauty products are seriously deficient when it comes to shaving care. Seriously…women’s shaving products just do not provide the same kind of experience as men’s shaving products. I’ve been shaving my head for over 15 years, and over that time I’ve experienced the misfortune of running out of shave gel. After trying Eve’s shaving gel ‘in a pinch’, I quickly arrived at this discovery that soap and water worked just as well as women’s shaving products. Once I discovered that, I told Eve…and then discovered that my shaving gel was being consumed more rapidly than ever before. Based on this experience, I thought that others might benefit from my recommendations. Again, I’m not asking you to trust my opinion on fashion or style; shaving products are an entirely different story, as it probably constitutes around 90% of all of my personal grooming. (Depending on how useful you all find this, I can also give a column on razors…again, another area where gender inequality is definitely alive and well.) I’ve tried a number of shaving gels, creams, and assorted other products over the years; these are the two that I’d recommend. Both do have fairly ‘neutral’ smells which will make them acceptable for women or men. This is my ‘go to’ shaving gel that is used on a regular basis. I’ve never used a gel that has given me the tight, close shave that this one does. A small amount of gel provides the full coverage needed for shaving, and acts to prevent nicks and cuts. That’s why I use it on my head, and why it’s worked so well for Eve’s shaving needs. It’s a clean, crisp smell that’s pleasant without being overpowering; meaning that there’s no pine cone, musk, or Aqua Velva ‘aroma’ trailing behind you for the rest of the day. Probably the best benefit is that the shaving is also moisturizing-meaning that there’s nothing else for me to remember to apply or use. Eve has also found the product to be very moisturizing on her sensitive skin. It’s pretty inexpensive and widely available, and it’s a product that you, as well as your significant other, can share. This is a product that’s used less often by me-mainly because I find it’s not as effective at giving a close shave to my head. However, it does a solid job on the beard/mustache area and has some attributes that will appeal to the less follically challenged. 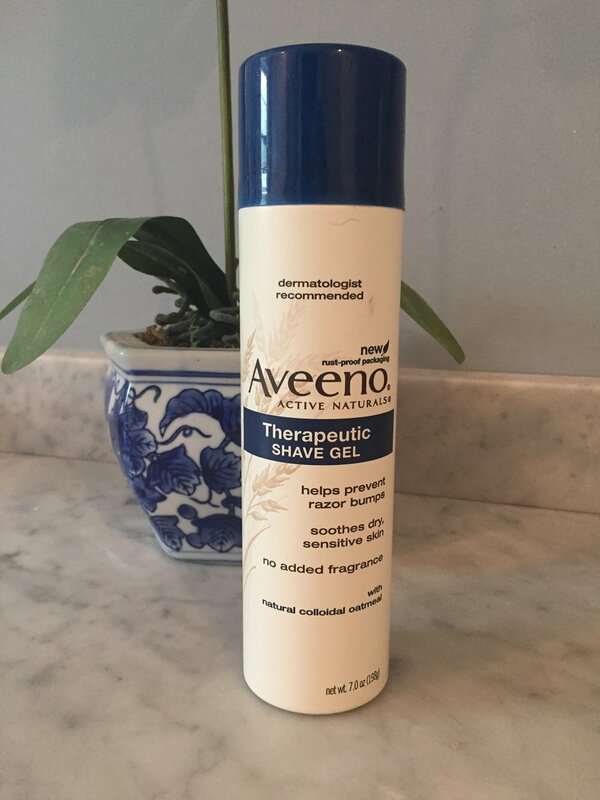 Similar to the Aveeno Shaving gel, Trader Joe's Honey Mango Shave Cream is a moisturizing product that doesn’t require any additional ‘follow up’ products after you shave. It has a clean scent that isn’t overwhelming, and the moisturizing is slightly superior to the Aveeno Shave Gel. My wife enjoys this product too. Obviously, you can only find this at Trader Joe’s-but I think that it’s definitely worth picking up in your next trip. (In case you missed it, Eve also loves Trader Joe’s). The Best Clip-In Hair Extension Hack Ever!